We are not unknown to amazing beauty and healing properties of crystals. 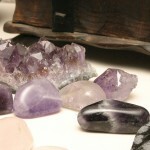 Most of us are habituated with Reiki crystals grids for distant healing and manifestation. Not many are aware that even single stone can be programmed for distant healing. Though crystal grid is more favorable as there are pencils placed that directs energy towards the main middle stone. Anyways, let me guide you how to program a crystal to send distant healing without any grid. Pick a cleansed crystal that resonates with your issue. Hold it in non-dominant palm and draw HSZSN intoning its name thrice. Now connect the crystal to the person or the situation. Draw CKR and SHK and give Reiki to the crystal with your intention for about 10 minutes. Place the crystal somewhere safe or carry with you always. Yes, it is that very simple. Suppose, you want to manifest a wish, which doesn’t include any person or particular situation, draw all the symbols on your stone and give Reiki visualizing or imagining your wish coming true. Pick a cleansed crystal. Take it half an inch away from your third eye. Ask source energy to fill you with divine white light. Beam white light into crystal from your third eye. Draw symbols with this white light with your third eye on the crystal. State your intention and hold your thought for 68 seconds, visualizing the outcome. Place the crystal somewhere safe or carry with you. “Hold the thought for just 17 seconds and Law of Attraction kicks in. Hold a thought for 68 seconds and things move; manifestation has begun” – Abraham Hicks. Write your intention on a piece of paper, draw symbols and fold the chit. Place a cleansed and programmed crystal over it. That’s it! Try not to pick very tiny tumbles. You can use multiple stones for single issue if they are tiny tumbles. I have listed below some common issues and related crystals. These are in no means only crystals related to issues, there are many more crystals. Also, crystals have multiple healing properties so each can be used for different issues too. Stress/Worry – Amethyst, Clear Quartz, Garnet, Citrine, Smoky Quartz, Carnelian, Selenite. Money/Career – Citrine, Green Aventurine, Tigers Eye, Pyrite, Sunstone, Smoky quartz, Jade, Moonstone, Carnelian. Heart/Emotions – Rose Quartz, Green Aventurine, Moonstone, Ruby. Weight loss – Tigers Eye, Gold Quartz, Yellow Aventurine, Apatite, Bloodstone, Citrine, Kyanite, Amethyst. Grounding – Red Jasper, Smoky Quartz, Camel Agate, Hematite, Kyanite, Black Tourmaline, Black Obsidian, Bloodstone, Carnelian. Protection – Black Tourmaline, Black Obsidian, Tigers Eye, Grey Jasper, Mica Agate, Selenite, Kyanite. Listed above are just basic issues and basic easily available crystals. Pick any as per your issue and program it for use. if we heal a person by distance by his photo, can we put 2 crystal with 2 different programming over single photo. Do we need to programme the crystal just once or every day or after 21 days?? how to programme a crystal? drawing reiki symbols on a crystal n say its name thrice =orogramming a crystal? drawing reiki symbols on a crystal n say its name thrice =programming a crystal? Program after cleansing every time.. Draw symbols. Hold between palms. Charge with reiki while stating intentions. Very nice Article! You are a crystal guru! Please heal my family(Corr) and me. We are all suffering from lethargy, energy loss and fatigue. Thank you and many blessings. Next post: What are Reiki Attunements All About?